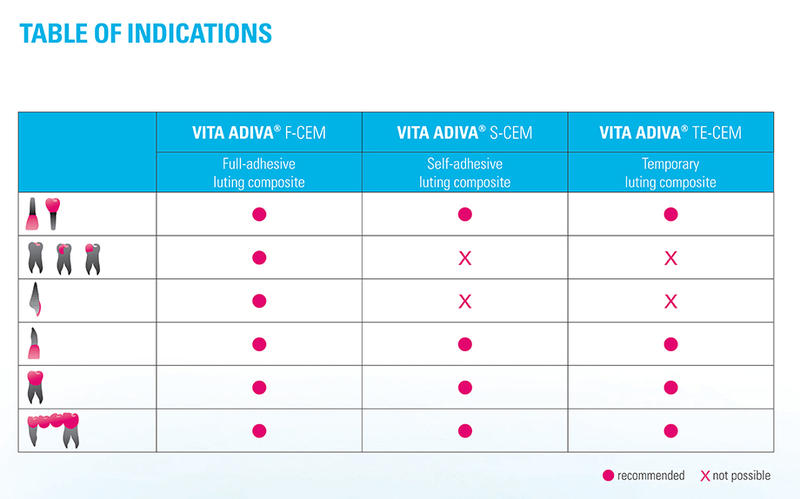 The self-adhesive luting system with perfectly matched components for conditioning the restorative material. Suitable for luting of all indirect restorations made of feldspar, glass and hybrid ceramics, zirconia, composite and metal. 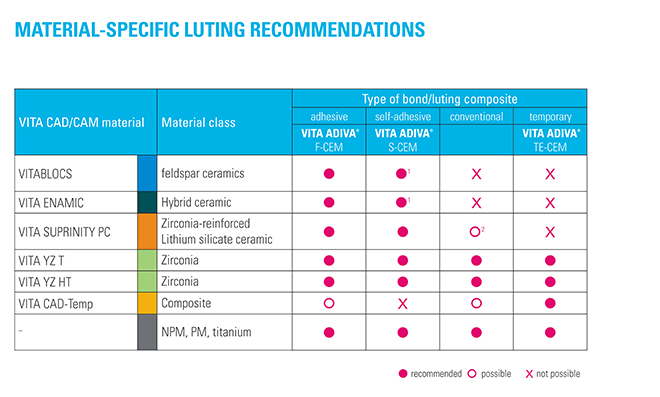 Luting numerous restorative materials with material-specific, matched coupling agents in a dependable way. 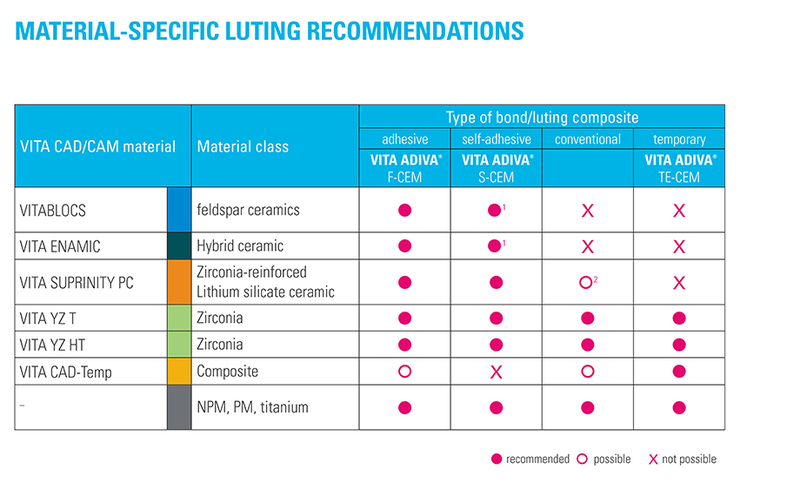 Process-proof luting thanks to a clearly structured luting set with systematically arranged and color-coded components. is a 5 % hydrofluoric acid gel used for etching restorations made of feldspar, glass and hybrid ceramics, to achieve a micromechanical bond between the restoration and luting composite. Intended for extraoral use only! is a coupling agent that creates a chemical bond between restorations made of feldspar, glass and hybrid ceramics and luting composite. is a coupling agent that creates a chemical bond between sintered zirconia restorations and luting composite. is a coupling agent that creates a chemical bond between sandblasted restorations made of titanium, non-precious metal alloys, precious metal alloys and luting composite. 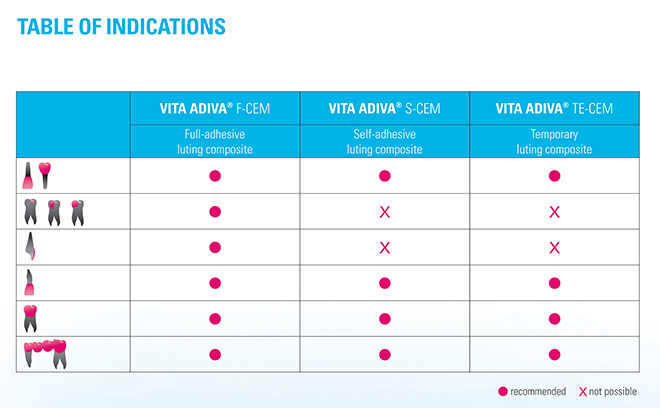 is a dual-curing, self-adhesive composite that's suitable for permanent luting of restorations made of feldspar, glass and hybrid ceramics, zirconia, composite and metal. is a neutral-colored glycerine gel used during luting to prevent the formation of an oxygen inhibition layer. Can also be used as a try-in paste.